March 27, 2015 — The latest Wood Markets annual survey of the "Top 20" Canadian and U.S. softwood lumber producers in 2014 shows modest gains by the industry in both countries as lumber demand continues to rise slowly (but steadily) in the U.S. as well as in key export markets. Total U.S. softwood lumber shipments increased 4.1 per cent to 31.3 billion bf and Canadian production recorded smaller gains, or +3.1 per cent to 24.2 billion bf. Corporate acquisitions were again a big part of the story as the Canadian buying frenzy continued in the U.S. South –since 2004 when only two U.S. sawmills were owned by Canadian companies (only West Fraser), there are now more than 35 mills that have been purchased by Canadian firms in the South as well as the U.S. West. These and other industry highlights were released last week in the March 2015 issue of Wood Markets Monthly International Report. The consultants at International Wood Markets Group, Vancouver B.C., have conducted this survey annually since 1997. Although the top 20 Canadian companies increased production slightly in 2014 (+0.6 per cent), they recorded a decrease in their marketshare of total Canadian lumber shipments, slipping to 78 per cent in 2014, from 80 per cent in 2013. The top five Canadian producers were Canfor, West Fraser, Tolko, Resolute and Interfor, with their order unchanged from 2013. However, output was lower for the top three Canadian companies due to their B.C. interior mills feeling the impact of the mountain pine beetle infestation. 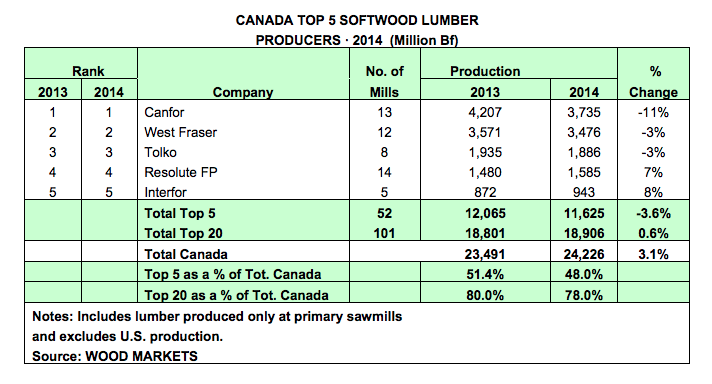 In 2014, these top five Canadian lumber companies produced a total of 11.6 billion bf (48.0 per cent of Canadian lumber output), versus 12.1 billion bf (51.4 per cent) in 2013. Canfor retained its lead spot despite its output dropping by 11 per cent (to 3.74 billion bf) due to the sale of its Daaquam mill (Quebec) and the closure of its Quesnel mill. In close second spot was West Fraser at 3.48 billion bf (down three per cent, due in part to the closure of its Houston mill). 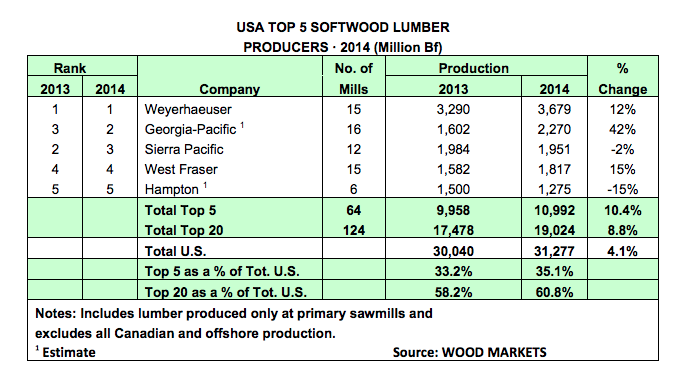 The top 20 U.S. firms produced 60.8 per cent of all American softwood lumber shipments in 2014, versus 58.2 per cent in 2013. This growth indicates that the largest U.S. producers (including Canadian firms) are continuing with their investment strategies aimed at increasing their capabilities and mill efficiencies in preparation for the ongoing U.S. lumber market recovery. Unlike Canada, the order of the top five U.S. companies shifted in 2014. While Weyerhaeuser (up 12 per cent to 3.3 billion bf) retained first place, Georgia-Pacific moved into second at 2.27 billion bf (up 42 per cent) following the complete addition of Temple-Inland’s five sawmills. Slipping from second to third was Sierra Pacific (down two per cent to 1.95 billion bf) as the company worked on the rebuild of its Quincy sawmill and commissioned work on a new sawmill in Frederickson, Wash. West Fraser kept its fourth spot, with output up 15 per cent to 1.82 billion bf and Hampton remained in fifth spot. The top five U.S. firms produced 35.1 per cent (11.0 billion bf; up 10.4 per cent over 2013) of U.S. lumber shipments, up from 33.2 per cent in 2013. Canada’s top five produced 48.0 per cent (11.6 billion bf; down 3.6 per cent vs. 2013) of Canadian lumber shipments, down from 51.4 per cent in 2013. “With the prospects of steady to stronger lumber demand and prices later in 2015 and into 2016 and 2017, there is still one major issue that the industry is watching closely: what happens in mid-October 2015 if the Softwood Lumber Agreement is not renewed between the U.S. and Canada,” said Taylor. This will be a key discussion topic in one of the panel sessions at Wood Markets’ 5th Annual Global Softwood Log & Lumber Conference in Vancouver, B.C., on May 7. The complete Top 20 lists and further analysis are available to subscribers of Wood Markets Monthly International Report. For further information or details on the “Top 20” lists, please contact: International Wood Markets Group at (1) 604-801-5996 or email Russell Taylor at retaylor@woodmarkets.com.